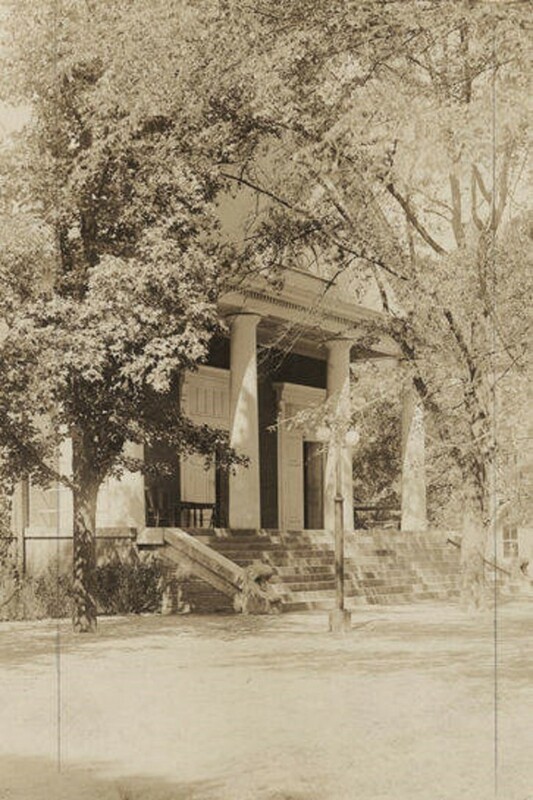 East Alabama Male College was an educational institution of high grade, established by members of the Methodist Church in east Alabama and chartered by the legislature. The charter was vetoed by the governor, but finally passed by the constitutional majority over his objections, February 1, 1856. The trustees named in the act of incorporation are as follows: Rev. John B. Glenn, Col. N. J. Scott, A. Frazer, J. M. Carlton, J. B. Ogletree. W. T. Davis, Isaac Hill, C. Raiford, Maj. J. F. White, Col. F. W. Dillard, Prof. John Darby, Dr. J. W. Jones, Maj. Wesley Williams, Simeon Perry, Edwin Reese, Auburn; Rev. W. A. McCarthy, Rev. O. R. Flue, Rev. Mark Andrews, Rev. 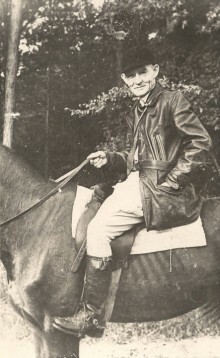 Samuel Armstrong. Rev. C. D. Oliver, Rev. W. B. Neal, Hon. John E. Groce. Talladega; Hon. Wm. Garrett, Coosa; Hon. E. R. Flewellen, Barbour; Rev. F. G. Ferguson, Rev. W. H. McDaniel, Rev. Lewis Dowdell, Rev. E. J. Hamill, Alabama Conference; Daniel Pratt, Autauga; Hon. James F. Dowell, Rev. Sam. Harris, Chambers: Rev. 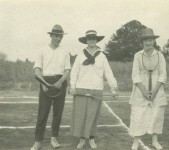 A. Lipscombe, D. D., David Clopton, Esq., J. W. Willis. Hon. Robert Dougherty, Tuskegee; Hon. R. A. Baker. Duke W. Goodman, Mobile; Dr. N. B. Powell, Dr. W. H. Ellison, J. B. Banks, Esq., Hon J.•Defunct.Cunningham, Arnold Seals, Esq., Macon; John McTyeire, Russell; Frank. Gilmer, Montgomery County; John B. Tate, Russell; John P. Nails, Lowndes; Hon. Thomas H. Watts. Montgomery; E. G. Richards, Chambers; Rev. 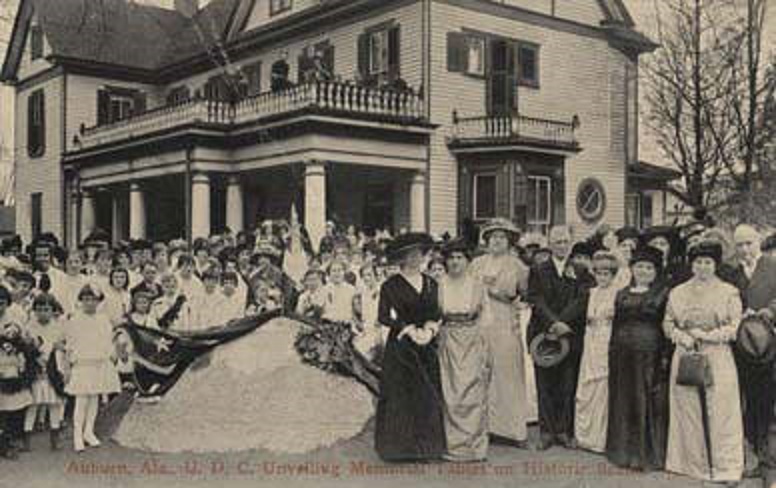 J. M. Jennings, Alabama Conference, and their successors. The session of the Alabama Conference held at Eutaw determined upon the location of a male college in the bounds of that ecclesiastical body. 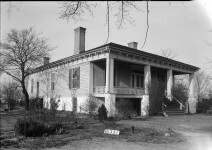 After a sharp contest between Greensboro and Auburn, the former was adopted as the location, and the Southern University was chartered by the legislature January 25, 1856, in further development of plans. The trustees, taking immediate action located the school at Auburn, then in Macon, but now in Lee County. In 1857 the cornerstone of the main building was laid, with Bishop George F. Pierce as the principal speaker. 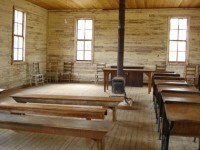 The first session opened October 1, 1859. Shortly thereafter the conference convened in Eufaula November 30, and the new college at Auburn presented its claims for denominational support. 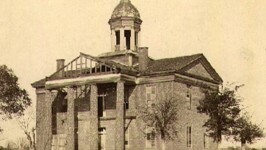 Bitter opposition arose on the part of the friends of the Southern University, but after full debate, the conference voted to take the East Alabama Male College under its patronage. In 1856 the board of trustees for the East Alabama Male College accepted control of Slaton’s Male Academy, which, became the preparatory division of the new school, thus making two Methodist institutions of college grade in the State. Rev. William J. Sasnett was the first president. Rev. E. J. Hamill was appointed financial agent in 1856. Slaton’s Academy opened on the corner of present day Tichenor and North Gay. It’s headmaster was William F. Slaton, a prominent Methodist who had influential friends, such as William Lowndes Yancy, A. A. Lipscomb and James F. Dowdell. 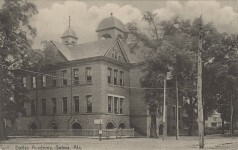 The preparatory school opened in January 1857, with an enrollment of one hundred students. When the college opened in 1859, the preparatory school’s enrollment had already increased to one hundred and thirteen students. 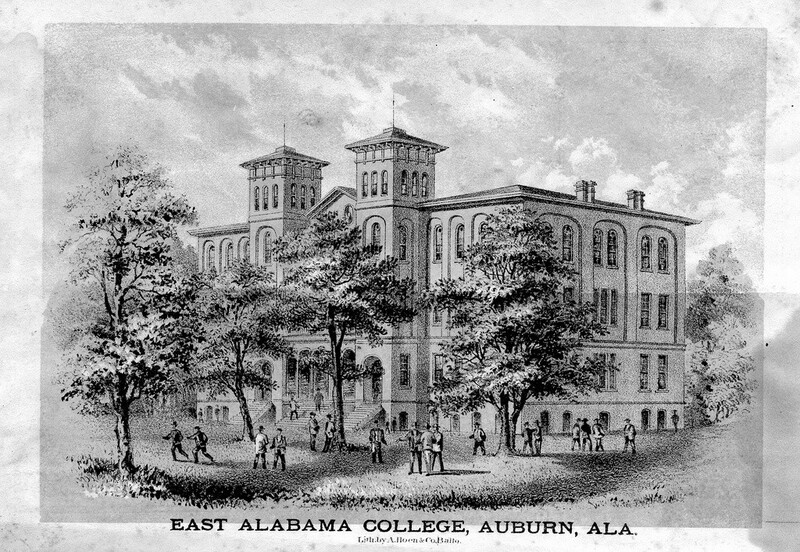 On October 1, 1859, the East Alabama Male College formally opened in tandem with the already established preparatory division. 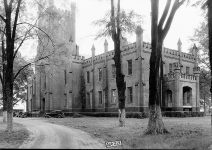 It is said to have been “well equipped for a classical college, with apparatus and appliances, and had a prosperous career until it suspended in 1862.” Rev. Mr. Sasnett and Rev. Mr. Hamill continued in their positions until suspension, and the former nominally until his death, November 3, 1865. 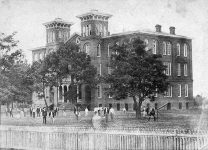 While the preparatory school remained in operation during the Civil War, the college suspended operation to become a hospital. The exercises were resumed on September 5, 1866, with Rev. James F. Dowdell A, M., as president. He was succeeded by Rev. Alex D. McVoy at the session of 1869. 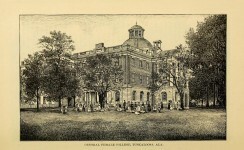 In the latter part of 1871, plans for the organization under Federal aid, of an agricultural and mechanical college had about matured, and the board of trustees of the East Alabama Male College made a tender of its property to the State, which was formally accepted by the legislature. February 26, 1872. At that date Hon. David Clopton was president, and Gen. George P. Harrison was secretary of the board of trustees. The trustees had previously executed a deed of conveyance to the State, dated February 17, 1872. On March 22, 1872 the agricultural and mechanical college was organized by the election of a faculty, consisting of the members of the faculty of the old college, two additional professors, and a commandant. By this action of the new institution, there was no interruption of the school work. 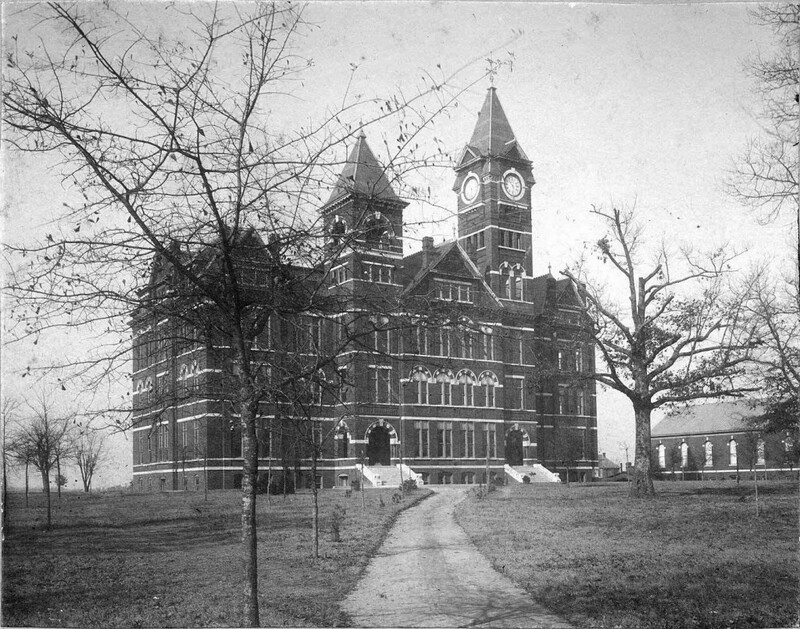 As a part of the gift, it was provided that the senior class of the East Alabama Male College should graduate in June 1872, and that its alumni, should be recognized as the alumni of the Agricultural and Mechanical College. As an Auburn fan… I agree. Love my church and this school! War Eagle! Their research keeps your cows alive. I am proud to say that one of my ancestors was an early Auburn grad, a legacy that continued through generations down to my parents. with highest honors and earned the first degree in Electrical Engineering ever conferred in Alabama. Member of SigmaNu fraternity, Rotary Club, etc. Most active in founding and supporting Perry Street (later St. Mark s) Methodist Church. Founded Moseley Electric Company. From the book George Shackelford and Annette Jeter and their Descendants, published 1941. Wow, just imagine if Auburn were just a few minutes from The University of Alabama? Wonder how the football programs would have turned out? I had no idea about this Alabama history. I have seen photos of Old Main, check out the digital collection of AU photos. Google Auburn Digital photos. 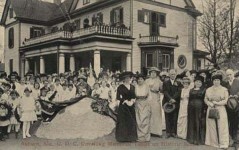 You know the oldest building on campus was moved from the girls college. It was closed before the war, after only East Alabama reopen. They moved the girls chapel (now Langdon Hall) taking down the steeple, to their campus to use as class room space/ then auditorium.. AU also is one of a handful of city/colleges in US to be granted a Carnegie Library…to meet the matching grant it took both to raise money…why AU Library has remained open to the public.